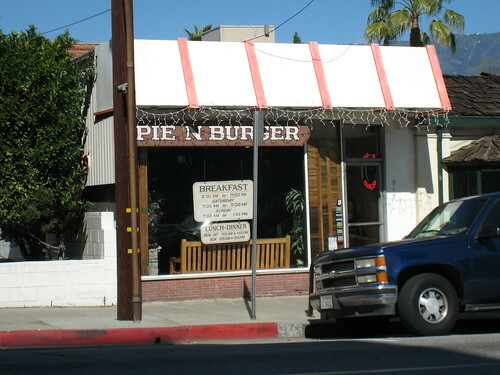 Pie’n Burger, how do I love thee? Let me count the ways. I love thee for thy pecan pies, available for sale over the counter. I love thee for thy succulent, dripping hamburgers, even though I am mostly a vegetarian. I love thee for the tiny ice cubes in the drinks you serve. I love thee for thine hand-mixed glasses of Coke with extra syrup. I love thee for the counter seating and servers with a little attitude. Waiting with the crumbled remnants of a Sunday paper for a spot at the counter, or if you’re extra diligent at one of the handful of tables along the wall. There are hashbrowns, and deathly thick bacon, and cinnamon rolls the size of your head. One of the best secrets of Pasadena dining!!!!! P.S. You should check out Connall’s on Washington Blvd….a few blocks east of Hill & Washington. It’s an awesome diner. this looks sooo good and is making me soo hungry. Maybe we can visit there next time?